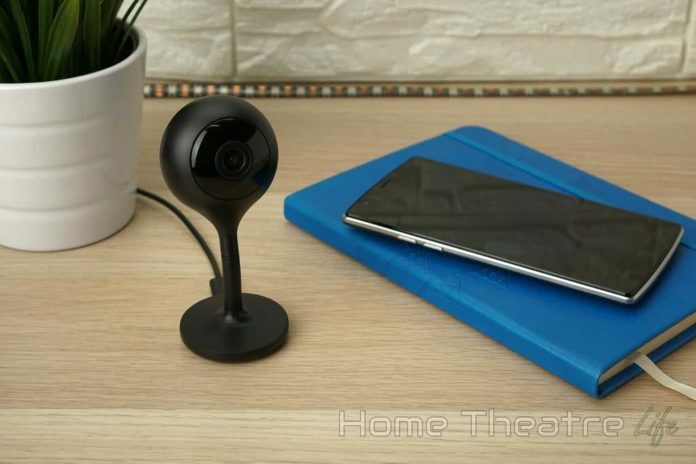 Home Android TV Boxes MECO WiFi IP Camera Review: Is This 1080p Security Camera Worth It? Wifi security cameras are becoming incredibly popular as they’re an easy way to set up some basic home security. 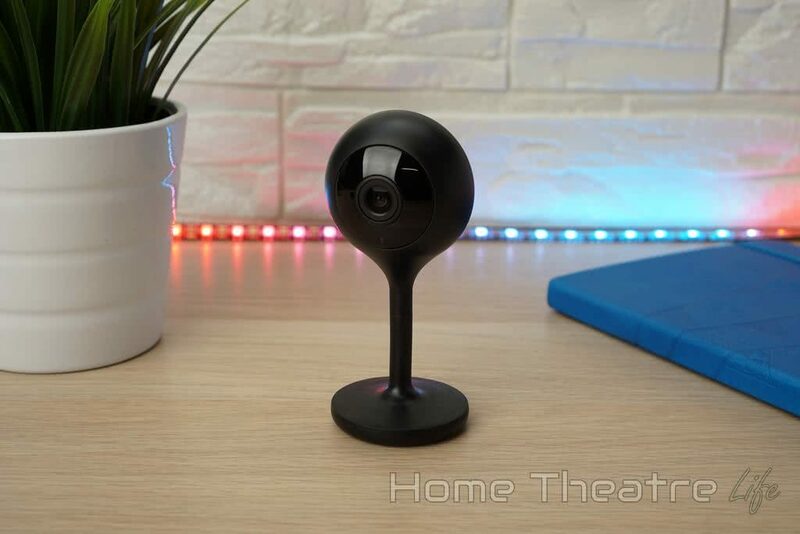 The MECO WiFi IP Camera is a 1080p budget wifi camera that claims to offer some pretty impressive features that rival the likes of larger companies at a fraction of the cost. In this review, we put the MECO WiFi IP Camera through its paces, looking at the hardware, software and image quality to answer the most important question of all: is it worth it? 6 Should You Buy The MECO WiFi IP Camera? The MECO WiFi IP Camera certainly boasts an impressive set of features – despite its budget price tag. The camera’s 1080p sensor offers high resolution images for great clarity – an incredibly important factor if you ever need to identify an intruder from your security camera’s footage. Additionally, thanks to the device’s 8 infrared LEDs and built-in night vision mode, you can see up to 30 feet in the dark. This is fully configurable, with separate day and night modes or you can leave it up to the camera to select the best one based on the available light. Everything is handled via the CloudEdge app, which not only lets you watch video streams no matter wherever you are, but also lets you watch your video alerts, adjust your camera’s settings and even update its firmware. Intruder detection can be based on either motion or sound (with the sensitivity of both being fully adjustable in the app). The company claims “AI humanoid detection” to identify invalid alerts. Everything is handled via the CloudEdge app, which not only lets you watch video streams no matter wherever you are, but also lets you watch your video alerts, adjust your camera’s settings and even update its firmware. 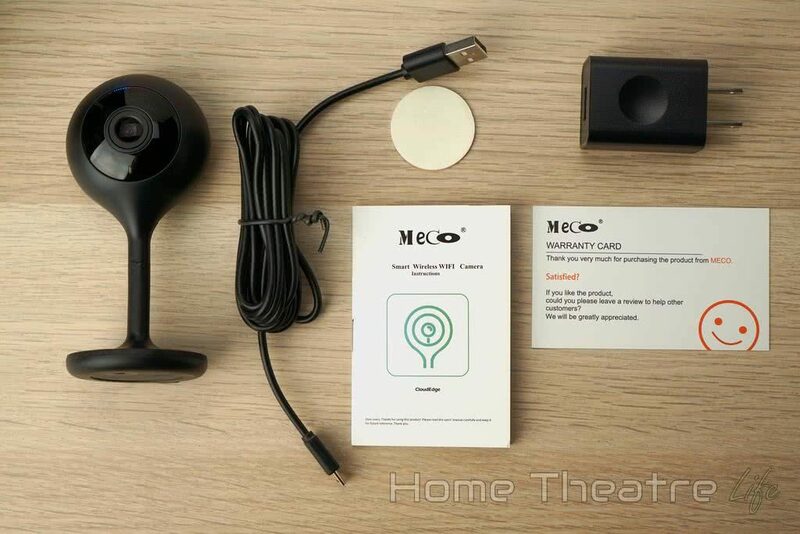 The MECO WiFi IP Camera is certainly a unique looking camera. The all-in-one design combines the camera module with an flexible integrated stand so you can aim the camera exactly where you need it to. The stand can be stiff at times so it may take a bit of effort to get it EXACTLY where you want it. The camera sports a 1/3″ CMOS sensor that offers 1080p video at 25fps whilst an F2.0 lens offers good low light performance. This allows the MECO camera to offer images that are clear and reasonably sharp – more than enough for identifying faces or number plates. Around the back is a reset button and a small speaker that’s used for the device’s intercom function. The speakers are basic and quite quiet – whilst you can definitely understand what’s being said, it’s not hard for ambient noise to drown them out rendering them completely useless. A micro SD card slot on the side lets you record all your footage locally, or you can opt for the paid cloud storage option. Everything is powered by a micro USB cable which offers a huge amount of flexibility in terms of setting up your camera in the perfect location. You can use the included USB power adapter and micro USB cable for a more traditional fixed camera set up or connect up a USB powerbank for a portable security solution whenever you need it. 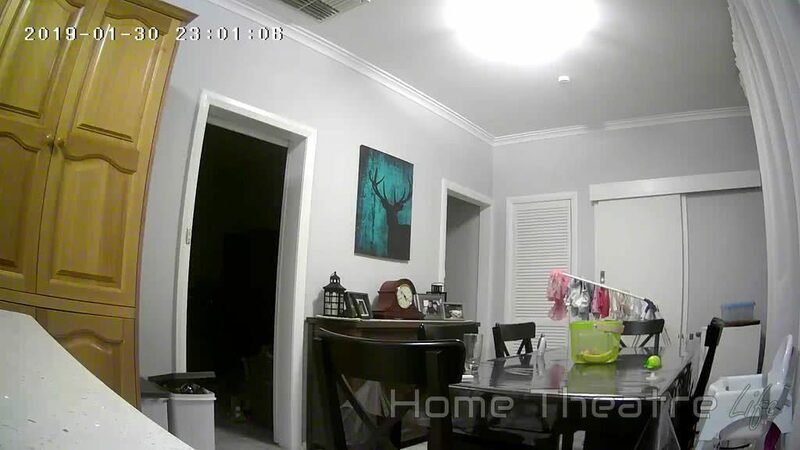 The MECO WiFi IP Camera is configured entirely via the CloudEdge app (available on both Android and iOS) and I’m glad to report that the I was pretty impressed with the app overall. Apps on these budget products tend to be on the janky side but the CloudEdge app was impressively well-thought out. It’s not as polished as the Yi Home app but it’s around 90% of the way there. The entire setup process was simple,with a wizard that guides you through the whole process. 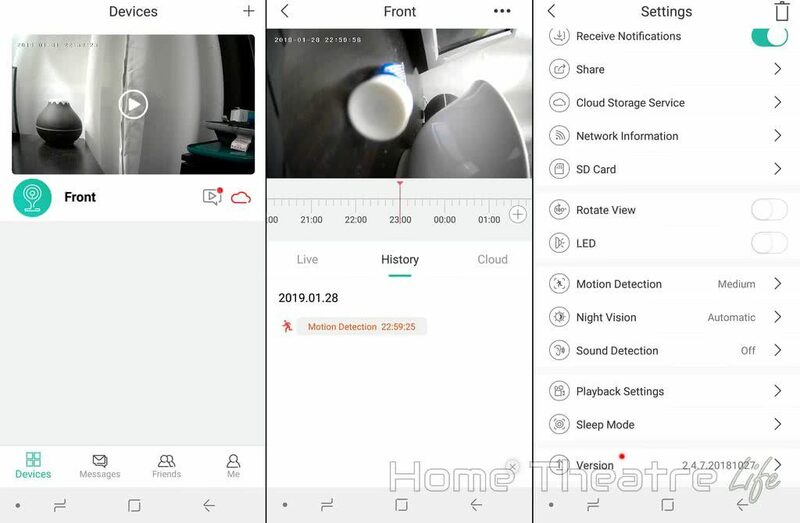 After a brief setup process, you’ll be presented with a dashboard of your connected cameras (I’m not sure if there’s a device limit though I’d be surprised if there was). Tapping on a particular camera will start its live stream. Streams take a few seconds to show up but not long enough that its a problem. Whilst I find it slower than my Yi Home Cameras, it’s far faster than the much more expensive Arlo cameras. You can view your camera from anywhere in the world and can select a number of resolutions to match your internet speed. So if you’ve got crappy wifi, you can watch a 360p feed to get an idea of what’s happening without a tonne of buffering. When watching the stream, you can take a snapshot, record a clip straight to your phone, communicate via the camera using the built-in intercom and toggle motion detection alerts. The history tab lets you view a timeline of motion detection or sound activated events. However, the default timeline view isn’t ideal as you need to scroll to find specific events. Tapping on the Alarm button shows you a list of actual events which loads the video when you tap on it. It’s a far better experience and should be the default. Lastly, there’s a cloud option which I didn’t test. MECO said their cloud recording option lets you record your camera’s video straight to the cloud – no micro SD card required. There’s a 7 day trial available for free but you’ll need to fork out a monthly fee for ongoing use. Firmware updates are handled via the app and I was pleased to see there was a firmware update available as soon as I connected the camera. You will need a micro SD card installed in order to download updates. I found the update process frustrating however. Firmware updates took ages to download and would randomly stop downloading, requiring me to reboot the camera to try again. It took me about 5-6 tries to finally update the firmware so I’m hoping future firmware updates go more smoothly. It also would have been nice to see a changelog to see exactly what you’re getting in the new firmware. Recorded clips can be set to 1, 2 or 3 minute lengths or the cameras feed can be continuously recorded for 24/7 monitoring. Even ONVIF support is included which is a massive plus if you’ve got an ONVIF-compatible recording setup as this opens the camera up to a huge range of recording devices such as Synology NAS’ and ONVIF-compatible network video recorders. The images captured by the MECO camera are decent, with enough detail to pick out facial details. However, some aggressive compression means that fine detail is lost. There’s also some distortion thanks to the super-wide angle of the lens, though this is only a minor issue as the full room coverage from a single camera more than compensates for it. Night images are probably what impressed me the most, with the MECO camera offering an impressively bright image coupled with strong infrared illumination in the dark. As you can see in the sample shots, detail remains pretty much the same despite some added noise. However, the added IR illumination has provided visibility into the corners of the room next door which is impressive. Should You Buy The MECO WiFi IP Camera? 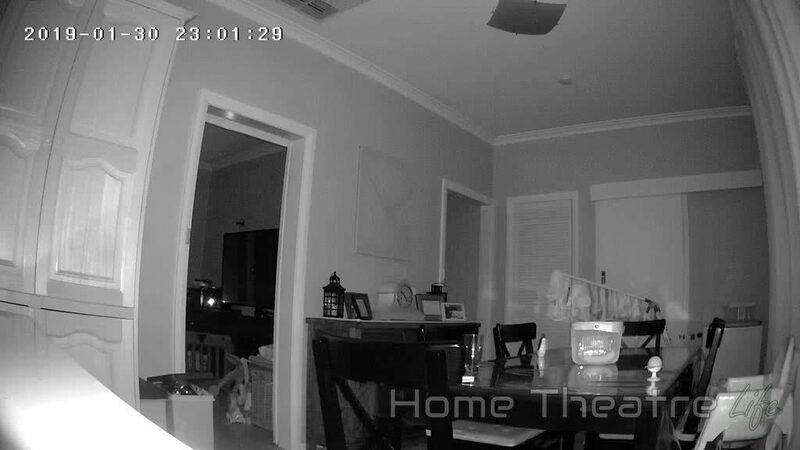 After two weeks of using the MECO WiFi IP Camera, I have to say i’m really impressed with the quality of the camera and even more so once you factor in its budget price tag. 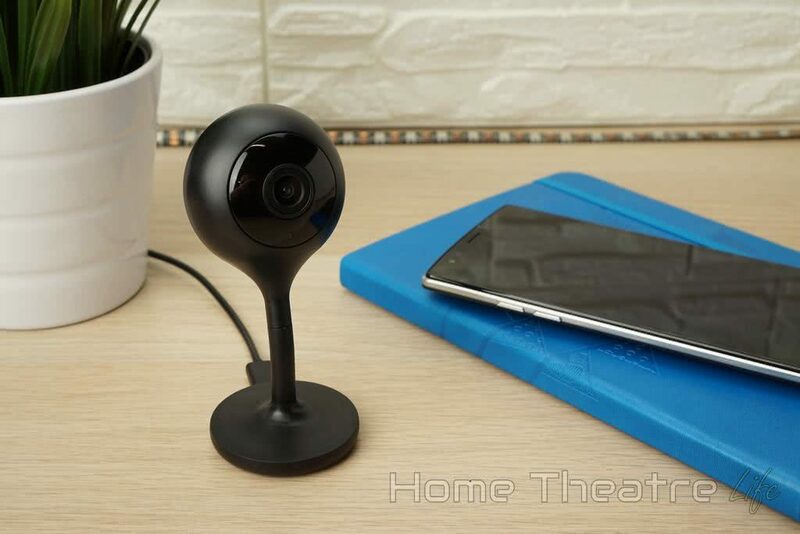 Despite its affordable price tag, you’re getting a 1080p camera backed by a surprisingly good app that lets you monitor your home wherever you are. 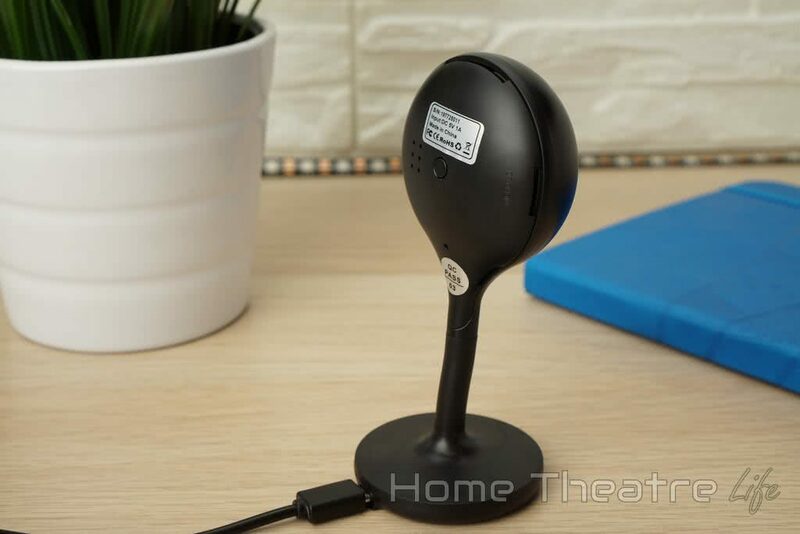 This makes the MECO Wifi camera an excellent budget security camera for those wanting to add the power of video surveillance without breaking the bank. The MECO WiFi IP Camera is available from Amazon. MECO have offered Home Theatre Life readers an exclusive discount. Use code U954DPBC via the link below and get a massive 30% off the price of the MECO IP camera until the 31st of March, 2019. The MECO Wifi IP Camera offers excellent value thanks to its 1080p image and solid app. Whilst the firmware update process had some issues, the overall package makes it an excellent option to add some extra security to your home.